Close on the heels of my recent post Common Basic Baking Terms - Part 1 , comes the next part. This again is my just my understanding and compilation from various sources, please feel free to correct me if I am wrong. Dip and sweep method : Different bakers use different methods of measuring flour, one being the dip and sweep method, the other, spoon and sweep method. To measure flour by dip and sweep method, the measuring cup is directly dipped into the flour container to fill it and then leveled out. Flour measured this way weighs 140 grams for a cup as the flour is compacted in the cup when dipped. Its relevant and important to know what method your recipe, book or author uses for measuring flour specially if your recipe doesn't give metric values. Also helps if you measure and not weigh your flour. Dock : When you do not want your rolled out pie / tart/ cookie/ puff pastry / pizza dough to blister in the oven as it bakes, you 'dock' the surface of the dough. Docking creates tiny little holes in the pastry, preventing blistering or too much rising of the dough where its not needed. You could use a fork to dock or even better a dough docker which makes your work quick and easy. A dough docker is a spiky little suspicious looking thing which rolls along your dough easily. You may not mind docking your pizza dough, but its great to have a dough docker if you need to bake a large batch of graham crackers or mille fuille for entertaining. Dribble : While making custard and custard based dishes, you need to add liquid, like hot milk to whisked eggs. Since you do not want to raise the temperature of the eggs all at once and risk curdling or scrambled eggs, you very slowly pour the hot milk little by little or 'dribble' the hot milk slowly into the egg mixture. Dust : To dust is to cover the surface with a dry ingredient such as flour or sugar or cocoa for example. You need to dust your baking tin or work surface with flour, dust the top of your Tiramisu with coffee or cocoa, dust the top of your cake with powdered sugar. Your recipe generally will tell you if you need to be generous or judicious when you dust. Dusting your baking tin with excessive flour unless specified will leave your cake with a slightly undesirable thickish crust. So watch out! Egg wash : If you have ever wondered what makes the tops or surface of some breads or pastry glisten and shine so invitingly, you are in all probabilities seeing something egg-washed prior to baking. An egg wash is basically just egg and some liquid (like milk or cream) whisked together and brushed on top of bread dough or scones. You normally need very little of the egg wash to cover your dough and you can expect a lot of it to be left over. Think up ways of using it up. If you do not use eggs, a mixture of sugar, oil and milk in equal quantities is supposed to do the trick. Flour : To 'flour' is to dust (your counter) with flour, lightly or generously as needed and directed. 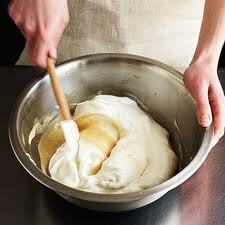 Fold in : Recipes often direct you to 'fold in' dry ingredients or whipped egg whites for example into your (cake) batter. Folding in means incorporating ingredients into a mixture very gently but thoroughly, the objective being retaining maximum air which you have carefully created. Its very important to learn this technique as it can make or ruin the texture of your bake, specially in a fatless sponge or genoise or a chiffon cake. Constant practice and probably a few flat sponges is the only way to learn this! Apart from technique and confidence (don't even remind me about over-confidence and failed cakes please), things which will greatly help here are good quality silicon spatulas (for regular cakes), balloon whisks and slotted skimmers for your genoise or chiffon cakes. A balloon whisk is hard to find here, but you can surely get a good slotted skimmer in your nearby steel store. I recently got myself slotted skimmers in varying sizes for different amounts of batter. 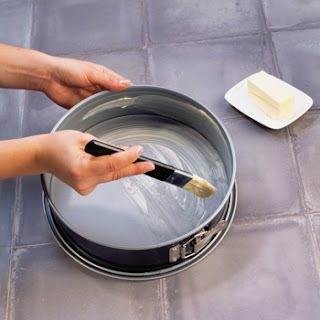 Grease : Greasing is applying grease or fat - oil, butter (preferably with a silicon brush) or using a non-stick spray on your baking tray or muffin cups or cake tins to aid easy release of your bakes from the tin. I like using oil for this. Greasing your pan gorgeously while baking pizza or focaccia helps get a crispy crust, while just enough should be alright when you bake cakes and breads. So you 'grease and flour' and line your tins with baking parchment - all for a neat surface and easy release. Laminated dough : This is dough made with alternating layers of dough and fat, usually butter. Butter is enclosed in the dough and then rolled out, folded (or given 'turns') and re-rolled repeatedly to multiply the number of such layers. The butter melts in the oven creating flaky layers. Puff pastry, croissants and danish pastry are classic examples of laminated dough. Line : To line is to cover the base and sometimes sides of your tins / baking sheets with baking parchment. Avoid using wax paper for this as the wax often melts. Lining helps easy release and also get a nice smooth bottom surface and sides, not to mention easy washing up later. Watch this video to see how to cut out and line tins. Though I never really get around to doing it, its helps and is a joy to have parchment cut into standard pan sizes, ready to use. You could also buy these online. Leavener / Leavening : To leaven means to 'make light or to raise'. A leavener is an agent which helps raise or lighten your bake. Classic examples are baking powder, baking soda, commercial and wild yeast. Foam cakes and some cakes like Queen Of Sheba, Almost Fudge Gateau have no chemical leaveners, whipped eggs/egg whites do the job. Mise en place (meez en plas) : Though not a baking term as such, this is a French phrase which means ' putting things in place'. As we see in the cookery shows on television. All ingredients measured and lined up. Helps a lot in making sure you have all ingredients for your bake without having to realize you don't have enough eggs as you melt the chocolate. Marble : The familiar marbled effect with 2 or more colors. Here you will come across this term in marbling cake batters or creating a marbled effect for decorative purposes in desserts. You alternate spoonfuls of batters of two colors in the pan and use a toothpick or skewer or knife to gently swirl the batter. Check this video here Or marble as shown in this video. 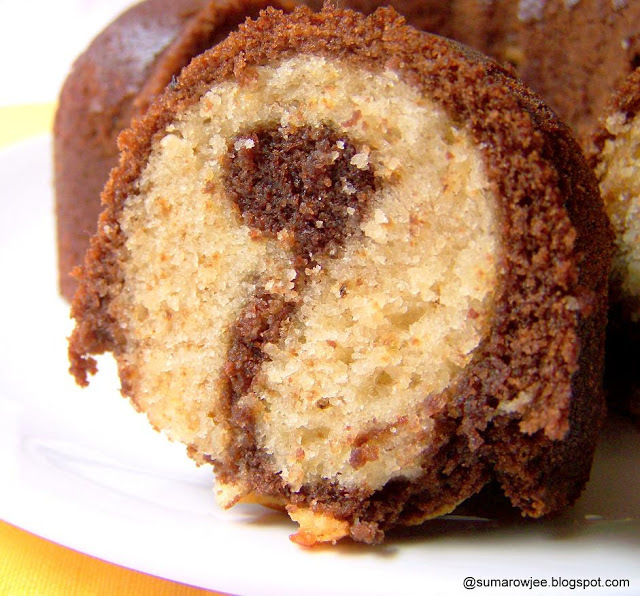 This creates a very interesting effect in the baked cake and each time the 'design' is different. For a ginko pattern, just scrape all the batter of one one color in your bundt pan in one layer, top with all the batter of the other color and bake. Important to temper your enthusiasm for swirling or you will regret it! Pipe : Apart from piping butter cream, whipped cream or ganache, you also pipe batter for making ladyfingers or Savioradi , macarons, pavlova, dacquoise etc. Piping bags are very handy to have for this purpose, though cones can be made with parchment too ( too much work, not as convenient). I like disposable bags and slightly large ones at that. You could snip a large one to make it small but not the other way round. Small bags tend to ooze out the cream or batter as you close the other end. A messy situation you could avoid. Most baking supplies store stock these. For very tiny quantities of ganache or cream (while decorating) small ziplock bags are best. Pre heat : Pre-heating is heating your oven to the needed temperature before placing your bake in. This is to ensure that the oven already is at the temperature you need when you bake goes inside. There are recipes though very rare, which need you to place the bake in a cold oven and then start heating it. Typically OTGs take longer to pre-heat and convection microwaves pre-heat really fast. Read more on this. Proof : Proofing in bread baking means ensuring your active dried yeast is active, alive and kicking. You normally need to proof active dried yeast, whereas its not necessary to proof instant yeast. Read more about this here. 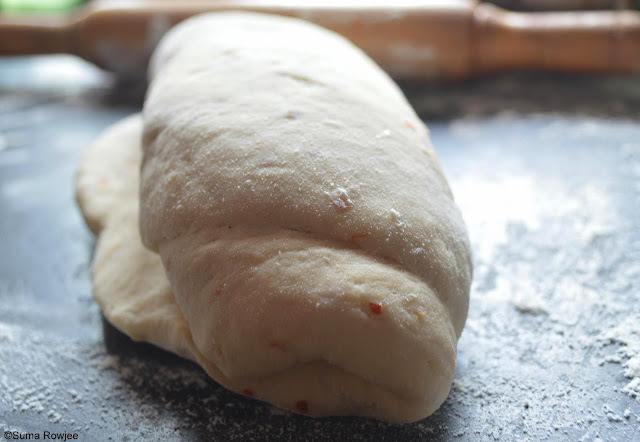 After the dough is kneaded, letting it rise till it doubles is also called proofing. 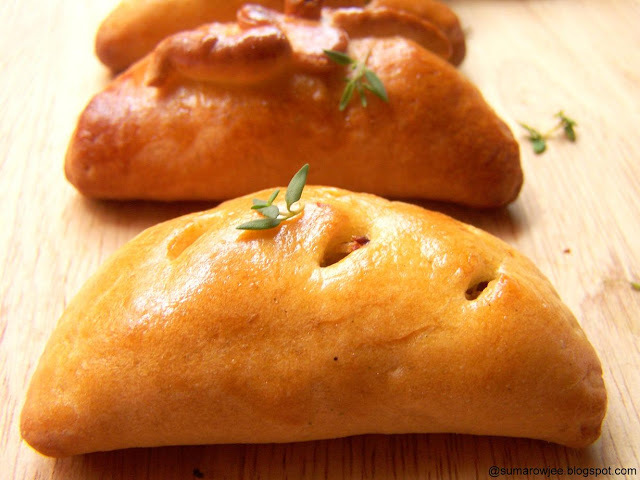 Letting the shaped dough double in the pan is also called proofing! Pre-ferment, poolish, starter : Bread dough is usually made by mixing all of the flour, yeast and liquid ingredients together at one go. Sometimes, bakers use a mix of commercial yeast (as opposed to wild yeast, this in the next part) flour and water, let it stand for sometime (as indicated in the recipe), sometimes overnight, before mixing it with the rest of the dough ingredients. This helps jump-start the flavor and the rising power of bread. Poolish is a kind of pre-ferment which is commonly accepted to indicate a combination of equal weights of water, flour and a very small amount of yeast - From King Arthur Flour Whole Grain Baking Book. Thanks a lot for teaching us so many new baking terms. 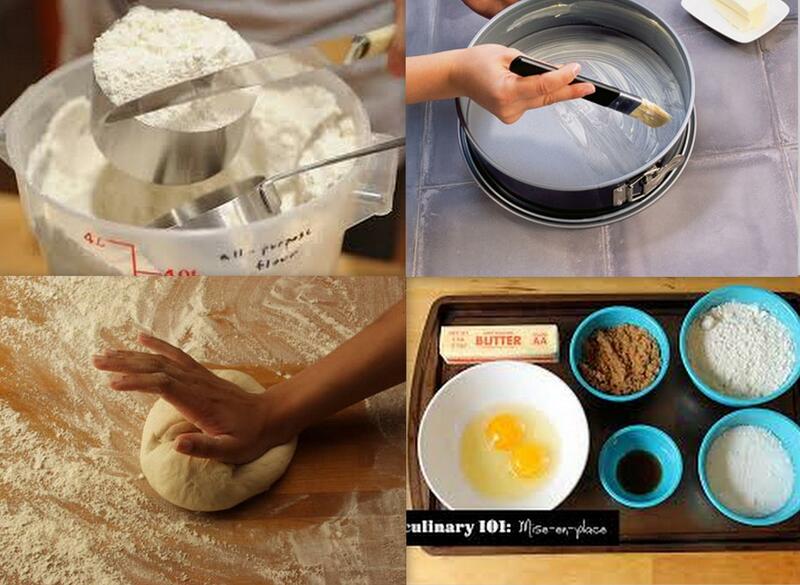 Happy to read and know these common basics of baking..